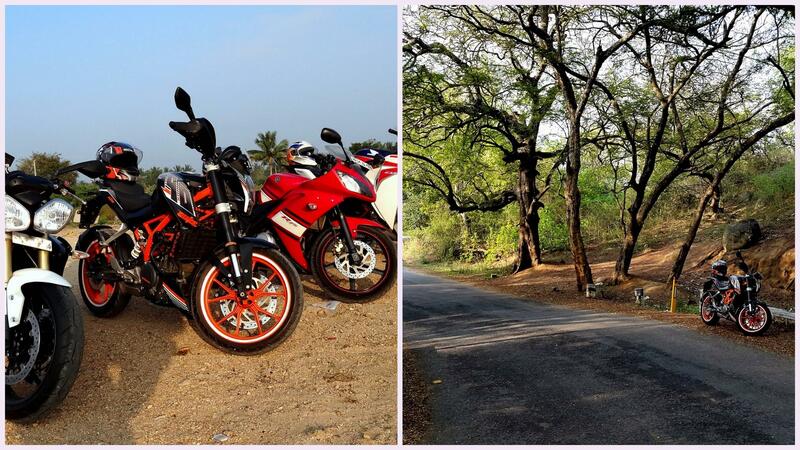 One of the subject of debates of every touring motorcyclist in India has been Group Riding vs Solo Riding. Very often, it has been people from the former who migrate to the latter, owing to a host of issues - most of them personal. Me, well, I'm of the breed who rides in both categories, albeit I try my best to keep my group limited to a maximum of 3, excluding me. Why? More the people. More the personalities. More the issues. I'll get back to that later. You see, we have grown up looking at posters of people in their 40s riding Harleys with tall handlebars along an American freeway. The very essence of group riding for us has been "brotherhood", which these leather wearers swear by, but rarely exhibit. At one point of our motorcycling life, we have dreamt of riding like that, get a photo clicked and then post it online with captions - "Enjoying freedom with my brothers". Hah! Both the sides here have their pros and cons. None holds advantage over the other. No matter how hard you debate and argue, at the end of the day it comes down to your personal choice. For some, that choice has worked. For some, it hasn't. You want to ride in a group? Sure. But what if people don't ratify your choice of destination? What if someone has issues with starting at 4 in the morning? You want to ride solo? Go on. What happens if you get a flat tyre or worn out clutch cable? What happens if, god forbidding, you get pasted on the ground by a SUV with black alloys? The essence of group motorcycling in India is pretty different from everywhere else, I feel. You have these people called "Marshals" (Person with the most expensive bike or most wrinkles) who stay at the end of the convoy, by its side and at its front. Very cool. Most biking "clubs" make it a point to carry a professional photographer along because hey, who's going to fetch us the eyeballs? Very cooler. Then you have this system of adorning your bike with flags/boards and obnoxious stuff like that. Very coolest. Are you riding a motorcycle for leisure or going for a war with an infantry brigade? The problem is this. A person with a motorcycle with a higher cubic capacity than you automatically decides it to be his birthright to tell you how to ride, when to ride, why to ride and where to ride. This is a fact. I have personally experienced this nonsense. Hell, I have seen these "Marshals" using whistles in the parking lots of restaurants directing people to park their bike facing the exit and not the conventional way. For the love of god! A good friend who was part of a riding club of a cult Indian motorcycling brand says this - "It was the beginning of my group riding days and I was riding along with them on an overcast day. I saw one of the riders from our group by the side of the road staring at his engine. I pulled over as well to check on him. You would expect the marshal to stop by and help, right? That's his duty! He didn't. He rode past as we were invisible. I helped the poor guy fix his cable and we moved on. When we reached the pit-stop, they had already left without us. When we finally reached the destination, they had reached 1.5 hours before us. When I asked the Marshal why didn't he stop, he replied - "My job is to make sure everyone rides in formation and doesn't slow down". Needless to say, that was the last time I rode with that group. Fortunately, good sense prevailed and I began to ride with like minded people from an automotive website I'm part of. Here's the catch. These people - I made it a point to know them enough to ride with them. In other words, I rode with my friends, rather than co-riders. The end result? I knew their every move on the road, I knew their tastes and most of all, they put their unanimous trust on me to decide on a destination and plan the ride. Why? Only and only because they had become my friends way before they became my co-riders. This is something that doesn't happen in brand sponsored rides at all. Take him to a fort and he will crib - "Bhai, kahan khandar mein le aaye"? Do a long ride and he will whine - "Itni garmi mein ride nahin karna chahiye tha." Take a couple of extra photo stops because the landscape is beautiful - "Abe chalo yaar, yeh kya ghaas phoos ka photo le rahe ho?" This fellow will stop after every 50 kms for a cigarette. Even if you stop for a moment to check the route on the GPS, he will light one up and waste a good 15 minutes. Because "baat shaat bhi toh karni hai". Stop for tea, stop for route check, stop for photographs - this one dude will always be on his phone without giving a damn to the etiquette. Replying to his wife holds more priority there. Only a "Hmm" will be his acknowledgement to the conversation even if the topic is of him being a douchebag. This is the most important type. Pay close attention. When you make a plan, this fellow will be the first to raise his hand and confirm. As the day of the ride comes closer, you'll observe he has suddenly gone silent on the WhatsApp group and as if to make you feel like Nostradamus, he will text the night before the ride at 11 PM - "Won't be able to make it. Not feeling well/Plans with Wife/Late night party/Sunday ko rakh lete." Needless to say, I abhor them the most. There will be this dude who will constantly go on braying about how expensive his helmet is, how difficult it was to import his jacket, how AliExpress stuff is not genuine, how he is planning to buy a new balaclava because the new one stinks. On and on - They will squeeze the patience out of you. However, as much as Group Riding has it's drawbacks, it has an equal number of advantages as well. Think about it. You have someone to watch your back in case things go south. You have someone to swap bikes with if you feel monotonous. You have someone to chat with at a place where there's not a soul in sight. Last but not the least, you have someone to click your photos for that ever elusive perfect display picture! - James Dickey from "Cherrylog Road"
Solo motorcycling, for me, is the art of riding a motorcycle on the motivation of your instincts, the inspiration of your passion and the fearlessness of your confidence. I have met and known many such riders whose courage baffles me. When they ride, they ride for themselves. A friend of mine who owns a Triumph Bonneville and rides with groups probably once a decade has this to say - "Freedom is my motivation for riding alone. No fears, no prejudices. Solo riding is not that difficult, I feel. Instead of thinking what could go wrong, think what can go right! My mantra is simple - Plan with pessimism, Ride with optimism. My wife is my eternal pillion on my rides. We enjoy our solitude. We enjoy the thrill of our motorcycle. I guess that's what motorcycling for me is all about". I don't ride solo much. I do it only when I feel I need to get my head sorted and that's something I do only when I'm alone. One of the beauties of solo motorcycling for me is that you have the freedom to stop when you want, ride when you want, photograph what you want and gaze at the ghaas phoos as much as you want. Returning from a solo ride has always given me a sense of realisation and confidence. On the broader spectrum, it has made me a wiser motorcyclist. It has made me aware of what I was missing and what I am missing. To know the value and importance of everything in life is very crucial, I feel. We often realise that once the train has left the station. Solo riding, which undoubtedly has colossal risks, can be perfected with immaculate planning, belief in self and most importantly, belief in your motorcycle. It's the true test of your machine - whether it disappoints your or not. As I mentioned earlier, at the end of the day, it's your personal choice that matters here. If you're the outgoing, extrovert type who has no issues with varying personalities, go for group motorcycling. My suggestion here - Ride with friends rather than strangers or co-riders. It is very important to know the road behaviour of the people in the group. As for my lone wolves, well, plan your ride out as if you're planning a heist. Make no scope of error. Be punctual and on schedule. Keep your motorcycle in tip-top condition and carry the basic tools, first aid and gear required. Congratulations, you just became the Bear Grylls of Motorcyclists! Good luck & Godspeed to all. Spot on obversations, enjoyed reading it. Had a good laugh because I could relate to most types. Keep 'em coming! Well written Barca! Agree with your observations on the group vs solo ride syndrome that most of us go through at some point. Convenience is what really matters for people going solo and the sense of accomplishment after a solo ride is worth the risks. A group ride has its advantages as well especially the sense of camaraderie with like minded riders and somebody to cover your back if the going gets tough. Very well written BarcaLad. You had me in splits with point number 2. Keep such articles coming. Very refreshing. Too many people can actually make travel un-fun. The lesser and closer the group the better. I like riding solo than riding group. My father joined a group riding, and he wanted me to join. But I always refused. I like the feeling I choose whether I go rather than arguing with the other options.